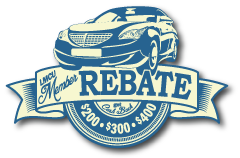 News from LMCU: Cash back rebates at Lake Michigan Auto Center! Cash back rebates at Lake Michigan Auto Center! Get a $200 to $400 cash back rebate on select vehicles. Just bring in your proof of LMCU membership (debit or credit card, loan statement, etc. ), and get up to $400 cash back when you buy from the Auto Center’s extensive stock of quality, late model used vehicles. Hurry, this offer won’t last forever! Call (616) 643-0605 or visit LMCU.org/Autocenter for details.